Comic Crossover is a quirky puzzle platforming action adventure that sees you exploring two comic book-based worlds that have become overrun by inky black slimes. In Comic Crossover you take control of a young boy named Hiro, who is the main character in a comic book called ‘Dreamers’. His comic book village is a cheerful place, but a strange man haunts his dreams and inky black slimes have invaded his world, wreaking havoc in the process. Hiro sets out on an adventure that will take him to some strange places as he attempts to track down the source of the infestation. Comic Crossover plays a little like a puzzle action platforming version of the SEGA classic, Comix Zone, with you making your way through frames in a comic book. 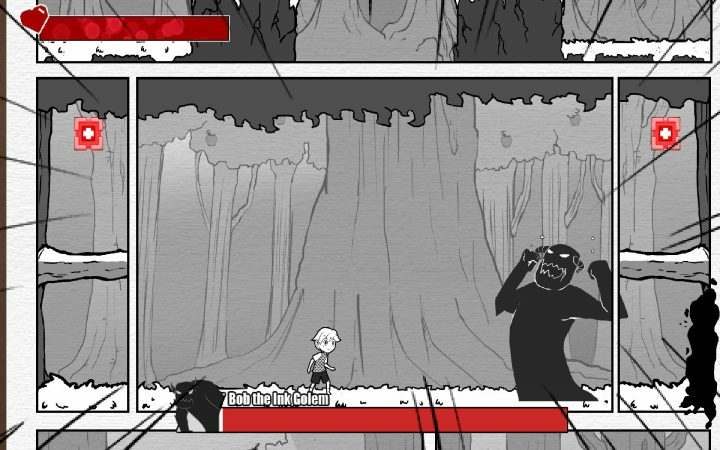 You can use the unique structure of the comic books to your advantage – such as jumping on NPC’s speech bubbles and using them as platforms or using the spaces between the frame as barriers which enemies can’t pass though. It’s a charming and fun little puzzle action platforming adventure that makes great use of it’s comic book-based game world. Unfortunately it has quite an abrupt ending (as if there is a missing comic book that’s still to be added) but it’s still a great little comic book romp well worth checking out.